County officials celebrated the reopening of Precinct 5 offices with a ribbon-cutting ceremony Friday in Elsa. ELSA — County and local officials on Friday celebrated the reopening of Precinct 5 justice of the peace and constable offices after a nearly seven-year hiatus. County commissioners in August voted to restore the Delta area justice of the peace and constable precinct offices — a jurisdiction that existed for a century before its contentious abolishment in 2011 by a 3-2 vote with County Judge Ramon Garcia in opposition of its elimination. 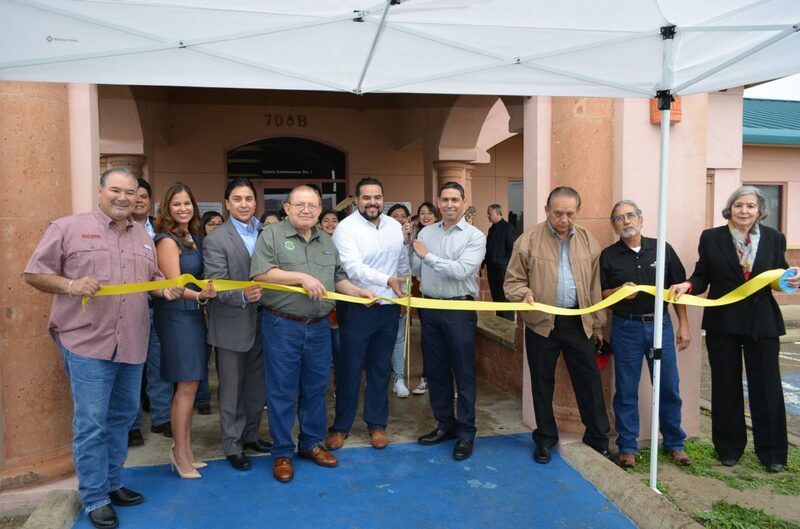 “There was no good reason, other than a political one, to take it away,” Garcia said during the grand reopening ceremony held Friday morning outside the offices located at 708 E. Edinburg Ave. in Elsa. The precinct’s elimination came the year after then Constable Eduardo “Walo” Bazan lost an appeal of his felony theft conviction. The Texas Constitution permits county commissioners to regulate the number of justices of the peace and constable precincts throughout the county. The two governmental entities must coexist in respective precincts throughout the state. Commissioners collectively restored Precinct 5 then appointed Justice of the Peace Jason Peña and Hidalgo County Constable Danny Marichalar to serve until November 2018 — when voters decide who will hold the positions for the next four-year term. Precinct 1 County Commissioner David Fuentes — who was elected in 2016 — said he only made two promises during his campaign: Work hard and work to restore Precinct 5 for the Delta area which encompasses Edcouch, Elsa, La Villa, Monte Alto and Hargill. While Edcouch, Elsa and La Villa each have a city government and individual police departments, Monte Alto and Hargill do not, which left the Hidalgo County Sheriff’s Office and state law enforcement agencies responding to the two areas located in the northern part of the county. Hidalgo County Constable Precinct 5 now has four deputy constables assigned to the jurisdiction, which runs from Farm-to-Market Road 493 to Mile 12 North Road and also includes rural portions of Mercedes, Donna and Weslaco. Deputy constables also serve as bailiffs for justices of the peace. Justices of the peace can oversee fine-only misdemeanor cases such as citations, evictions and civil cases up to $10,000. They also sign death certificates and officiate marriages. Peña wed 12 couples on Valentine’s Day. “It’s kinda like, we’re out in this little corner,” said Margie Pollock of Hargill who attended the ceremony. Pollock is part of a group citizens dubbed “Hargill 2020” which had been advocating for the return of Precinct 5. Prior to the reopening, residents like Pollock would have drive to Weslaco to see a justice of the peace -— an approximately 45-mile round trip. Elsa is only 12 miles away. Though Precinct 5 has its own office but not a courtroom, an interlocal agreement with the city of Elsa allows Peña to use the municipal court. Texas Department of Public Safety troopers have been directing residents receiving citations in Precinct 5 to Peña, he said. Peña is currently running for a four-year term against former Justice of the Peace E. (Speedy) Jackson who held the office when the precinct was abolished. Peña said he is considering stepping down from the Edcouch-Elsa school district board of trustees, if he’s elected to the justice of the peace position. “My commitment is to make sure this precinct stays open,” Peña said. Current interim Constable Danny Marichalar faces Cesar Gutierrez in the Democratic primary. Early voting runs through March 2 with primary election day on March 6.